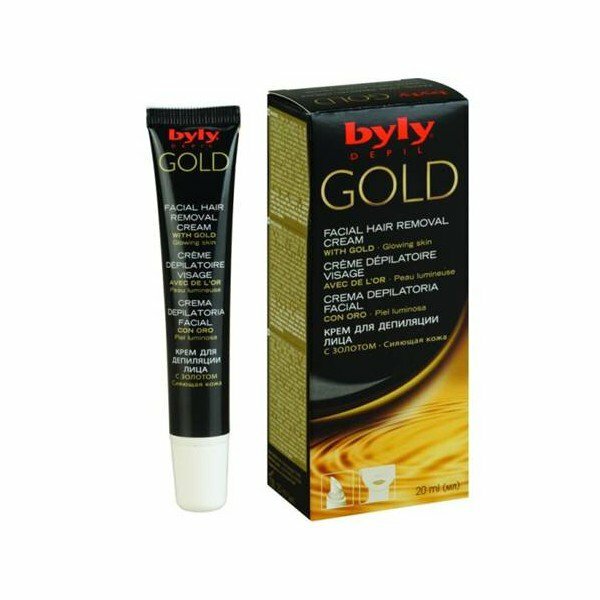 Gold Facial Hair Removal Cream is produced by the Spanish brand BYLY for its BYLY Depil Gold series. The cream contains tiny gold particles that leave your skin glowing. It is perfect for removing unwanted facial hair because it does not irritate sensitive skin and has a pronounced soothing effect. No more irritation and pain during and after depilation! This BYLY Depil cream effectively removes unwanted facial hair. It contains active substances that easily dissolve hair shafts without harming the surface of your skin. The cream contains moisturising ingredients that take care of your skin and make it soft, smooth and glowing. Its key ingredient is colloidal gold that stimulates skin cell respiration and metabolism, has a revitalising, lifting and smoothing effect on your skin. Gold Facial Hair Removal Cream will make your skin silky smooth in just 3 steps: spread the cream, leave it on for 5 to 10 minutes, then rinse. It's so easy and the result – clean, smooth, glowing skin – lasts for weeks. Package contents. 1 x 20 ml tube, 1 plastic spatula. Directions. Wash your skin with warm or lukewarm water and let it dry. With a spatula, spread a thin layer the cream evenly to fully coat the hair. Wash your hands immediately. Leave the cream on your skin for 5 minutes. Gently remove a small test area. If the hair is not removed easily, wait a couple of minutes more and retest. Rinse off the cream thoroughly with warm water. Dry the skin without rubbing it. Ingredients. Aqua (Water), Cetearyl Alcohol, Paraffinum Liquidum (Mineral Oil), Calcium Thioglycolate Hydroxide, Calcium Hydroxide, Ceteareth-20, Sodium Hydroxide, Acetyl Heptapeptide-9, Colloidal Gold, Silica, Parfum (Fragrance), Benzyl Benzoate, Limonene, Butylpheryl Methylpropional, Linalool. Want to buy Gold Facial Hair Removal Cream? Call us or submit your order via our web site!